Since 2016 populism has become a political utility, allowing many unlikely, and often reprehensible, actors to gain power. While some movements have been more successful than others, experts and the public alike do not challenge whether populism has dominated the west. The United States, Italy, and Brexit are among the most cited. Yet, populists in both Poland and Hungary have created significant issues as well. The pressing question is why populism is so dangerous and how can it be resolved before liberal democracy is eroded? To answer these questions, liberal democracy needs to be justified. Liberal democracy has brought power to the masses. Through establishing basic rights and freedoms that are supposed to be essentially untouchable and protected through an independent judiciary, it protects citizens from the most unjust violations of human rights. With representative democracy, citizens can freely vote for what political ideology they want to govern them, while not being consumed by the details and complexity of legislating policy. Further, these basic tenets have been expanded to guarantee citizens assurances such as free healthcare and education, the reduction of poverty, improved economics, and pursuit of a freer world. These institutions have been built slowly, but surely, spearheaded by rational thought stemming from the Enlightenment. To be sure, this is an over-simplification of liberal democracy, but its demonstrates the vitality of its institutions. Populism offers an opposing ideology. Both strongman rule and the use of divisive issues to evoke emotion, rather than rational thought, are primary tenets. It also ignores the basic rights of out-groups and manipulates truth and free press. Recent populism has become strongly authoritarian, especially in Eastern Europe. While authoritarianism is often connected to populism, in Eastern Europe it is likely to be so popular due to Russian President Putin’s success in utilizing it. Populism at its roots is a form of political tribalism. This along with its authoritarian leanings pose the greatest danger to liberal democracy. Authoritarianism is the political opposite of liberal democracy, while political tribalism is used as a transitional tool. By dividing the public on issues held at a tribal level, that is, when one identifies an issue as belonging to them at a personal, almost innate level and perceive it as unchangeable. There will be more on this below. There have been two core explanations for populism’s rise. The first is economic decline. Interestingly, populism was not an immediate response to the Great Recession. Rather, it built slowly over each passing election cycle. Economics can only be partially blamed though. Economies have rebounded and surpassed their pre-financial crisis numbers. It is particular parts of the economy that have shrank, creating the unrest. In the United States manufacturing and coal mining are classic examples of this. Many of these workers, male and relatively uneducated, play an important role in the rise of populism. This is a by-product of globalization. Overall, globalization has benefitted all countries involved, but in many modern democracies such as ones affected by populism, a small, but politically significant group has become unemployed. Globalization and economics are only a portion of the problem, and likely less important than social and cultural changes. Globalization has been affecting job distribution since the 1960s, but recent social movements that have empowered minorities, reducing the relative power of historically dominant white males have been brought to the forefront of politics. Many scholars are beginning to argue this, along with a greater acceptance of immigrants, has spread fear among the largely uneducated class of white males. Certainly others have the same sentiments, but it can be seen through polling data that uneducated, white males have the highest voting rates for populists. These are the sorts of tribal issues that have created significant divides. 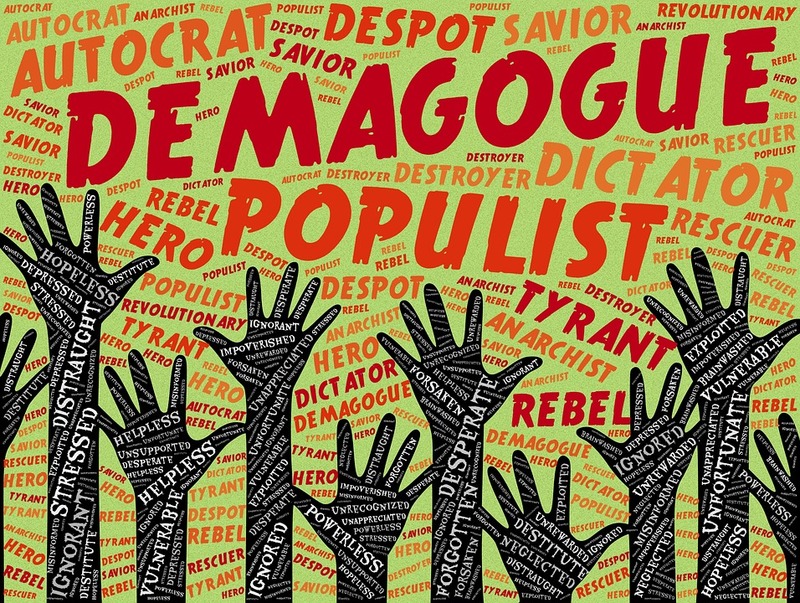 If populism is a reaction by a population that feels the current system has both left them out of its economic rise and taken their social power away, how are they to be appeased? First, by recognizing that this group is largely uneducated, one can ascertain that better education is needed. Of course, it is wrong to leave any group out of the economic rise that modern technology and globalization has brought. There must be new policies to offset these economic changes. Part II and III of this report outlined some, including: education reform, subsidized post-secondary education, and retraining programs. Secondly, protectors of liberal democracy must protect its institutions. The public must stand up against unlawful and immoral actions of populists, while conceding that democracies do include compromise. Minorities absolutely deserve the same treatment as white males at both the legal and cultural level. Yet, radical organizations and behaviour are not conducive to resolving the core issues. Rather, they support political polarization and unrest, which often encourage populism. Populism has been a symptom of the democratic process for nearly its entire history. It is the sensationalism of modern media and polarization of effects of social media have led to such fanatical views of the current situation. The current situation is not out of liberal democrats’ hands, but they do have a duty. It has been the champions of democracy and the public’s distaste for such an authoritarian and divisive rule that has defeated it in the past and the same can be done now.